The three-panel batik by local artist Mary Edna Fraser displayed against the split-face-stone tile fireplace in the living room. 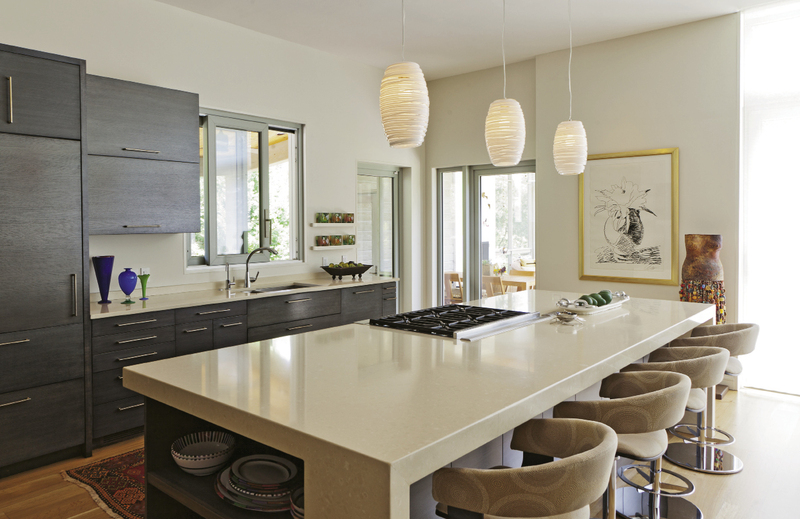 The addition encompasses an open living, dining, and kitchen space, which fosters a loft-like feel. A neutral color palette ensures the interior design complements the stunning views and prized artworks, like the black-and-white Andy Warhol in the kitchen. 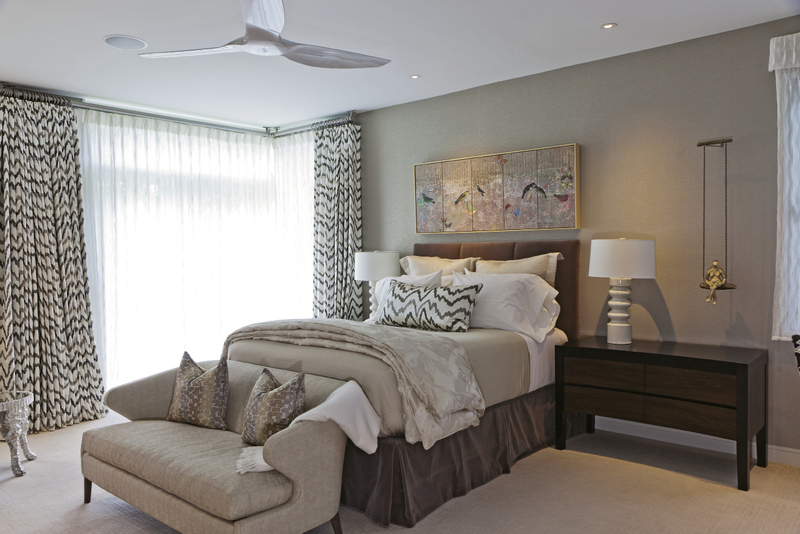 The palette is neutral, but textured wallpaper and drapes in patterned fabric by Donghia make a statement in the master bedroom. A sculpture by Tanya Lyons was an unexpected addition to the master bath. “It works perfectly, like she just threw her kimono over that bar, but it’s stainless steel,” Sanchez says. A sculpture by Park City artist Stacy Phillips reminds the lady of the house of her time out West. 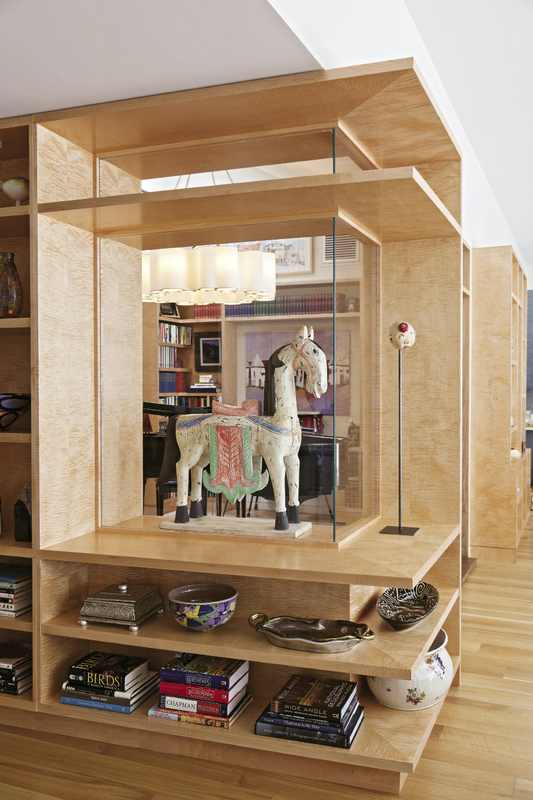 Built-in shelves with custom display cases showcase artwork while opening up the original rooms’ choppy layout. 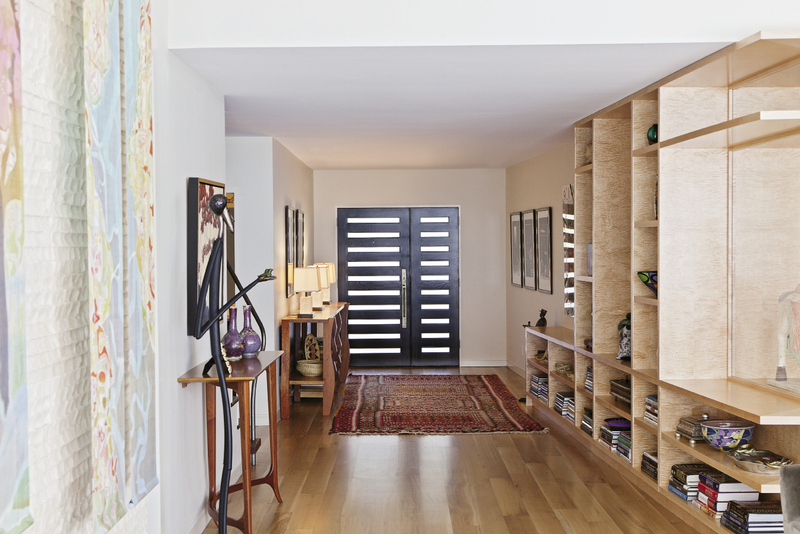 Gibson designed the angled wall that runs alongside the entryway to draw visitors into the home. 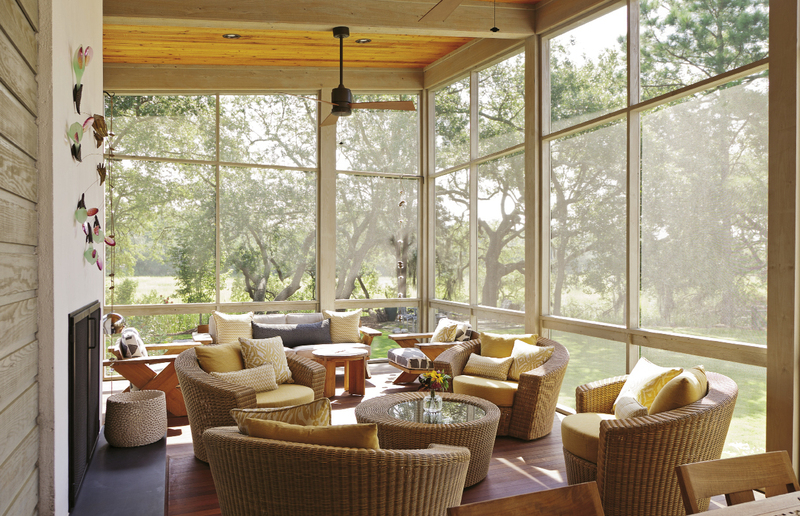 The screened-in living room is the homeowner’s happy place. One of her most recent art acquisitions—The Sowing, a sculpture by Charles Savoie—jazzes up the stucco-and-slate fireplace. 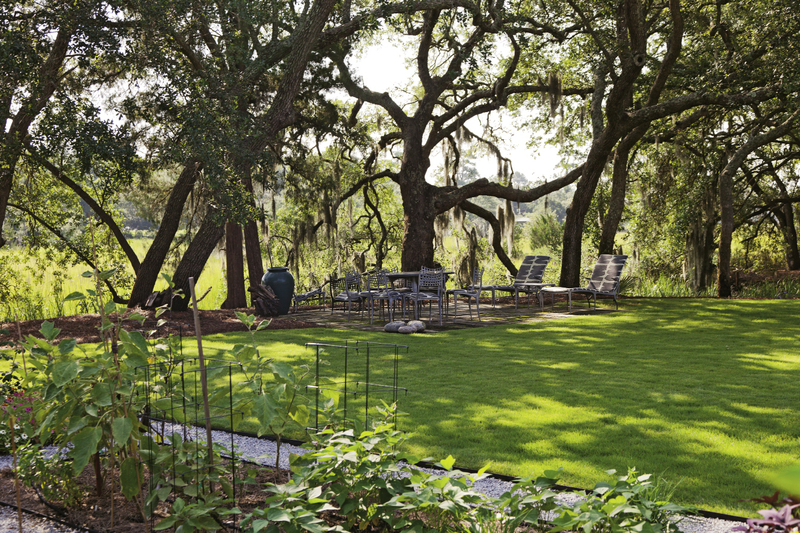 Otherwise, the space is outfitted simply with teak furnishings and woven chairs, so as not to distract from views of the gorgeous wetlands and live oaks. 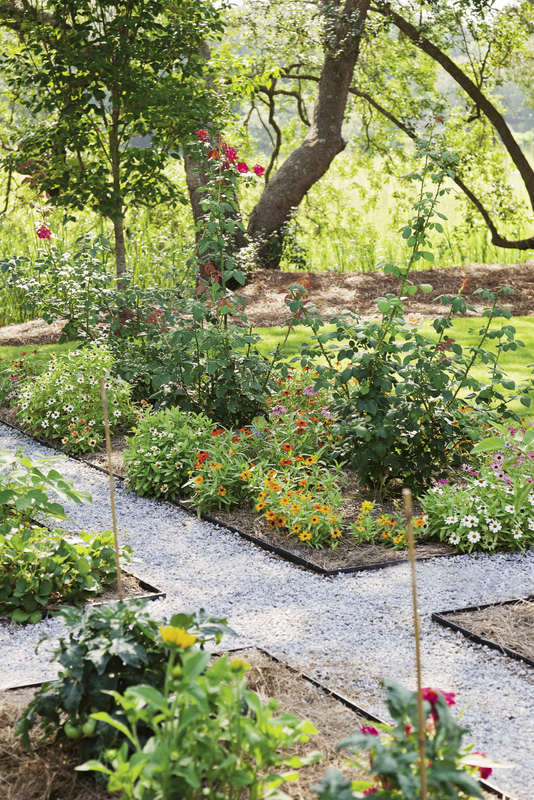 The garden and its bounty of veggies is conveniently right outside. 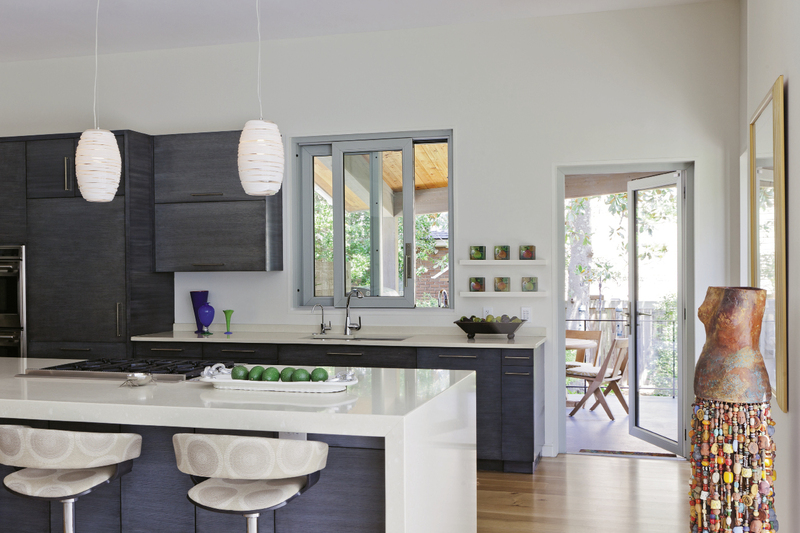 The rear addition is stunningly contemporary and communes with the site’s natural beauty. “The challenge was to have as many windows as possible, but also a lot of wall space for her art,” Sanchez says. 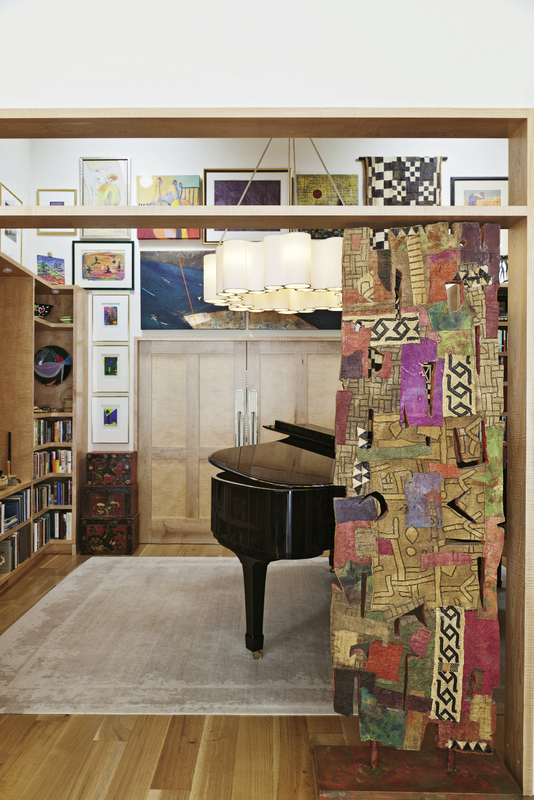 Many works, including the William Halsey sculpture that fits right into the doorway, found homes in this music room. If you’ve ever visited South Windermere, the West Ashley neighborhood tucked behind Earth Fare off Folly Road, then you’ve probably admired its winding tree-lined streets, gracefully patinaed homes, and stunning marsh views. But when a Charleston born-and-bred business owner and community volunteer decided to move back to town after more than a decade of living out West, she was drawn to the neighborhood by something deeper than its rustic beauty. She was raised here, in a creek-front, ranch-style abode, and for her, the move was about reconnecting with her roots and living amongst folks she’s known most of her life. Today, she happily occupies a handsome 3,830-square-foot brick residence a few doors down from her childhood home. And though she slipped right back into the neighborhood’s close-knit community—most every time she steps outside, friendly faces walking or biking by greet her by name, and many stop to chat—it took a year-long renovation and expansion project to bring full-on domestic bliss. When she bought the then-2,610-square-foot place back in 2009, she knew she wanted to overhaul certain elements, such as its choppy layout and too-small windows that did little to bring the outside in (“there was no relationship to nature at all,” she laments). But after falling in love with the lot’s spectacular natural beauty, especially its graceful live oaks and an expanse of wetlands easily accessible by a landbridge, she took the plunge and bought it, warts and all. “I kind of walked right through the building, and once I got to the backyard, I thought, ‘I don’t even care what the house is, this is the property I want to live on.’ It was magical,” she recalls. She lived in the home for a while, paying careful attention to what she wanted from a renovation. Ultimately, she craved an art-filled residence offering outdoor rooms for communing with nature and a scale that, while cozy enough for one or two, could accommodate a crowd during her fundraising fêtes. But she didn’t want to tear down the existing structure or build an addition that towered over nearby homes. “I wanted to be able to live with my things in a house that worked for me, but I also wanted to honor the neighborhood,” she explains. So in 2012, she assembled a team to help make it happen: Reggie Gibson, Alice Guess, and Anthony Carmola of Gibson Guess Architects (the firm is known for creating structures that feel connected to the landscape); interior designer Lauren Sanchez, whose portfolio brims with commercial and residential projects that are bold, yet understated and inviting; and renowned landscape architect Sheila Wertimer, whose work graces hundreds of private and public spaces in Charleston and beyond. All agreed to heed their client’s number one directive: after the project was complete, the residence must still blend in with its surroundings and suit her beloved South Windermere. The design team’s first order of business was establishing the abode’s new layout. Gibson and his crew were tasked with expanding its overall footprint and opening up the existing rooms, which he says were “pretty chopped up.” To kick things off, he drew up a single-story rear addition, sticking with 11-foot ceilings so as not to disrupt the street-facing roofline. “We didn’t want to go any bigger than we needed to,” he says. And because he envisioned a contemporary, clean-lined interior, he enlisted NBM Construction—a local firm that doesn’t primarily serve residential clients—to handle the building arm of the project. “The house wasn’t designed with crown molding or traditional finishes, so their commercial experience was right for the job,” the homeowner explains. The homeowner has a colorful personality, and she loves patterns. Knowing this, Sanchez set out to create an interior design that was bold enough to suit her client’s tastes, yet low-key enough that it wouldn’t distract from the long marsh views or the amazing artworks to be displayed in the home. To accomplish this, she selected furnishings with a low profile, and then layered in neutral-colored textiles in an array of patterns and textures—diamond weave, flame stitch, modern floral, ikat, velvet, and more all live together harmoniously. The resulting look reflects the homeowner without taking away from the stunning vistas. And the neutral palette allows prized possessions, such as the black-and-white Andy Warhol hanging in the kitchen and the custom batik by local artist Mary Edna Fraser that cleverly conceals the living room television, to shine. “Even the walls are a soft creamy shade because it helps to highlight the art without detracting from all the other elements,” Sanchez says. Thus designed and furnished, the natural beauty of the site stars even inside the house. 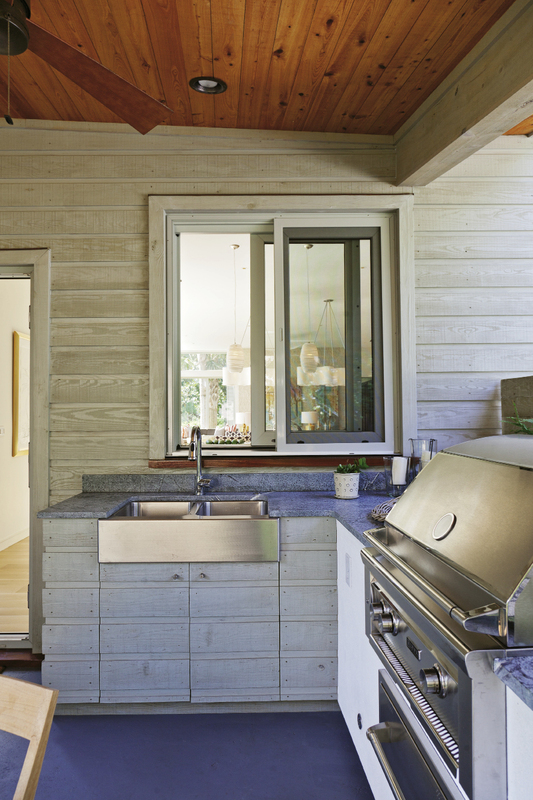 In the master bath, louvered doors are set on sliding tracks in front of long windows. When they’re flung open, the lady of the house can relax in the tub and gaze out over the wetlands in her backyard. And perhaps her favorite space is the screened-in porch, with its stucco-and-slate fireplace, teak furnishings, and concealed television console, providing everything she needs to find her zen. “That’s where I’ll be at any given time,” she says. Post-renovation, the home’s rear exterior, with its shed roofing and floor-to-ceiling windows, is stunningly contemporary. And though the façade was freshened up—a limewash was applied to the brick; the front-porch pillars were replaced with sleeker, more angular versions; and a purposeless “balcony to nowhere” was removed, amongst other subtle tweaks—the abode still looks right at home in the neighborhood. 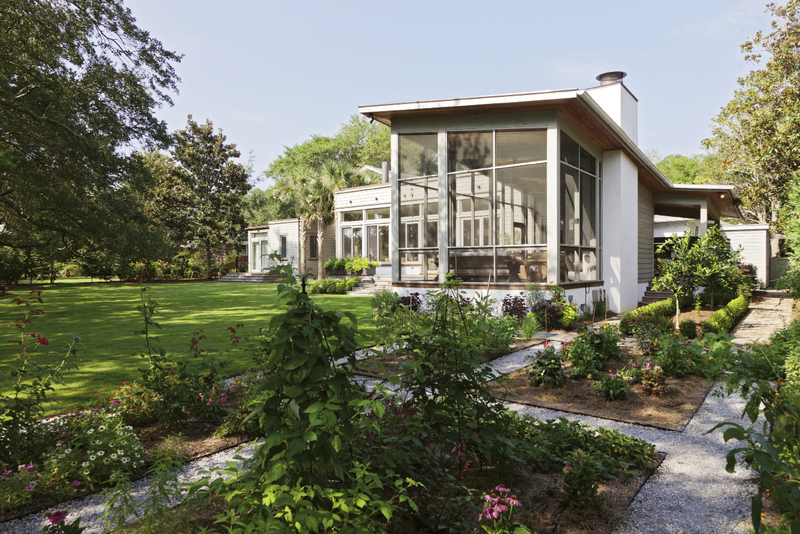 The landscape follows suit: in the front yard, Sheila Wertimer chose plants that are typical of old Charleston and South Windermere, such as azaleas, camellias, and magnolias. In the back, simple grasses, like lomandra and sweetgrass, are compatible with both the marsh and the modern silhouette of the new structure.